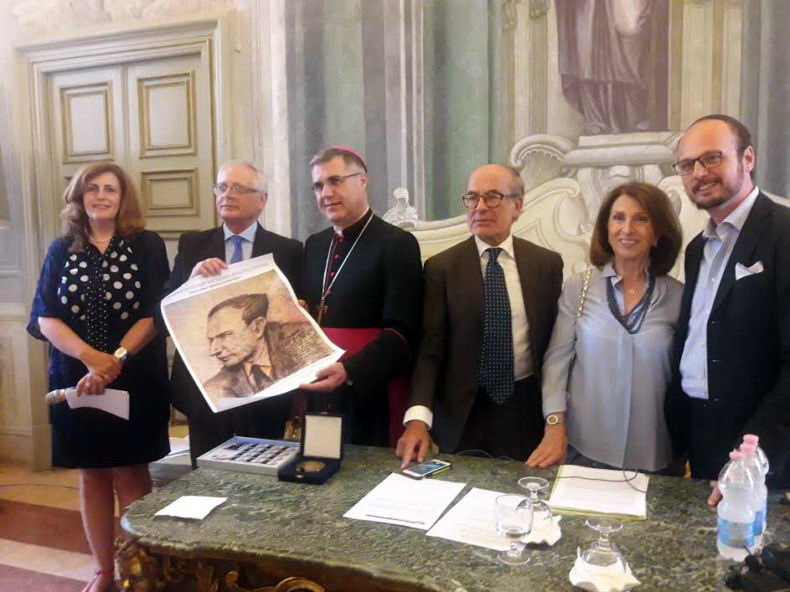 PALERMO – “This is the first step on a long path,” Archbishop of Palermo Corrado Lorefice said Thursday upon receiving the Raoul Wallenberg Medal for having transferred to the Jewish community a churchowned facility built atop the ruins of the Great Synagogue of Palermo. Addressing the audience at a celebratory event at his residence, Lorefice was moved to tears as a he delivered a heartfelt speech. “This is the first step on long path that we are called to together, to reach God on the day when all the people will be together in paradise,” he said. In the audience were representatives of the Christian, Jewish and Muslim faiths, their presence underscoring an emphasis placed throughout the event on the importance of interfaith relations among all communities. “This is an opportunity to strengthen the relationship between the Christian and Jewish communities,” Lorefice told The Jerusalem Post, hailing the moment as “the fruits of a long friendship.” He added that it would not only enrich both communities, but also serve as an example to society at large. Lorefice noted that it was important to “rediscover the beauty of the roots of our identity” because people must remember where they come from in order to understand who they are. “If Christianity doesn’t remember that it was born out of the Jewish faith, then it doesn’t understand who it is,” he said, adding that recognition of the Christian community by the Jews was equally important. “Palermo is a place that welcomes everyone,” he said, reiterating another message that was drummed home throughout the event. The transfer of the building was requested by the Sicilian Institute of Jewish Studies in conjunction with the Jerusalem- based nonprofit Shavei Israel, which is active around the world in communities of bnei anusim, the descendants of Jews who were forcibly converted to Christianity centuries ago. Rabbi Pinhas Punturello, Shavei Israel’s emissary to Sicily, serves as spiritual leader for the island’s tiny Jewish community and will be the primary operator of the synagogue. He has been active in helping to revive the once-thriving community. For several years, members of the Jewish community had been discussing with the mayor the idea of reviving the old synagogue, but the issue did not appear to be progressing. Last year, Sicilian Institute of Jewish Studies president Evelyn Aouate and other members of the institute approached Lorefice. Twenty days later, the archbishop called Aouate with a positive response. 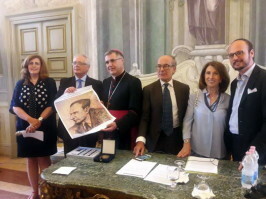 Speaking on behalf of the Union of Italian Jewish Communities, its vice president, Giulio DiSegni, expressed the organization’s “deepest gratitude to those who opened a new perspective for Jewish life in Sicily,” specifically mentioning Lorefice and the archdiocese. “Taking a look back to the past, we know that Sicily has an extremely important Jewish history,” he said. “After sacking Jerusalem, the Romans deported over 30,000 Jews to the island. During the Middle Ages, about 50 towns and cities in Sicily had their Jewish quarter, or giudecca. Under Norman rule, Jewish communities flourished all over the island, greatly contributing to Sicily’s cultural and economic development, [coming] to probably constitute onetenth of the island’s population,” he said. He went on to speak of how this part of the island’s history was abruptly “cut off,” with the expulsions and forcible conversions of Jews during the Spanish Inquisition. The date chosen for the official handover of the facility this year was January 12, the same date as the deadline in 1493 for the expulsion of Jews from the island by order of Queen Isabella I of Castile and King Ferdinand of Aragon. The synagogue is currently undergoing refurbishment and is expected to become active next year. The Raoul Wallenberg Foundation is generally seen as highlighting the efforts of those who save innocent people. But Guillermo Bruschtein, vice president of the foundation, noted that this also includes those who rescue cultural, ethnic and religious symbols. Aouate said: “I think this is the only case in the world like this.” She added that it was “justice – like Wallenberg,” referring to the wartime Swedish diplomat who saved tens of thousands of Jews in Nazi-occupied Hungary with special passports before disappearing into Soviet captivity. While expressing hope that the community, which currently numbers only several dozen, will grow, she said that the synagogue would be “a point of reference” for all Jews who pass through. “I hope that there will always be a minyan,” added Aouate, who currently hosts prayer services in her home. The writer was hosted by the Raoul Wallenberg Foundation.